Our product range includes a wide range of fire lagging ropes, asbestos textile lagging rope, industrial asbestos lagging rope and fiber filled fluff asbestos lagging rope. 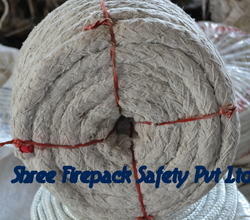 We are the leading manufacturer, supplier and importer of Fire Lagging Ropes. Asbestos Textile Lagging Rope is of the simplest forms of removable lagging or thermal insulating ropes. A fine canvas is often used as a weather proofing or finishing wrap on a rope lagging covered pipe, the canvas is then coated with bituminous heat resistant paint. Alternatively a wrap of roofing felt can be used. The Asbestos Soft Lagging Rope offered by us is a IS specified rope. Owing to high strength and greater efficiency, our Asbestos Soft Lagging Rope is high on demand throughout the country. Also, Asbestos Soft Lagging Rope finds application in many industrial applications. Extensively used for industrial power houses, marine steam and exhaust pipelines. Our customers can avail from us a wide range of Industrial Asbestos Lagging Rope These ropes are manufactured using fine grade of asbestos fiber, which is procured from the trusted vendors of the market. Moreover, we offer these ropes in various sizes to meet the variegated demands of the customers. The ropes offered by us are mainly used in heavy machinery industry like heat insulation of pipes, hot blast valves and boiler sealing. As a low density asbestos Fiber Filled Fluff Asbestos Lagging Rope enclosed in a wide mesh braided (fishnet/diamond) cover. It is made up in coils in rope form. This lagging is one of the simplest forms of removable lagging packings or heat insulating material. It is extensively used for the insulation of industrial, power house and marine steam pipe line. For temperature upto 300oc which covers majority of general industrial and marine application it gives very efficient services.